Now that some large companies (Google, Yahoo, Facebook, Akamai and Limelight Networks to name a few) are stepping up to the plate, World IPv6 Day is looking to be an awesome IPv6 event. However, ISPs are going to get a lot of calls about slow connections and possibly even no connection to these sites from their customers. The good news is that 6to4 and Teredo tunnels have improved in performance in recent months, so it wouldn’t be as bad as it would have been if it happened, say, last year. As well, with the focus on a specific day, hardware makers, software vendors, and ISPs have a target to get ready for this event, so hopefully, while problems can and will still happen, everyone at least has a chance to be prepared for them. What are your plans for June 8th, 2011? 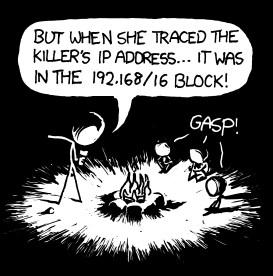 When will we run out of IPv4 addresses? I’ve been kind of working on a post about IPv4 exhaustion. It’s been hard though, because I’m not much of a statistics nut. Fortunately, there exists a Veng Diagram where someone falls into an IP nut *and* a statistics nut. Geoff Huston has provided us with some good info on IPv4 exhaustion with this guide. He also gives us a “when” prediction here. The number that most people are currently throwing out is the date that IANA will run out of numbers. But there are at least 2 levels below them. RIRs (Regional Internet Registries) and LIRs/ISPs (Local Internet Registries/Internet Service Providers. An LIR is usually some type of ISP). So there will be some time after IANA runs out before RIRs run out, then some time after that before ISPs run out. However, if you think that means that you can take your time before implementing IPv6, you’re quite wrong. We’re not looking at much more than 3 or 4 years before ISPs run out (and that’s quite optimistic.) If you deal in anyway with the Asia Pacific area, it’s likely MUCH less. That’s not a lot of time to get a whole new infrastructure tested, tuned, hardened, implemented and supported. If you deal with home users, you’re going to have to do a whole lot more work. There aren’t a lot of end users that are even prepared to deal with IPv6 yet. You’ll have to figure out how to support devices that don’t work on IPv6 (CGN is one way, and it’s not pretty). If you aren’t mired in the details by now, you’re behind, and it’s just going to start costing more and more to get your network up to snuff the longer you delay. There are a few ISPs starting trials to their end customers. These guys will have the clear advantage in support and knowledge base when the time comes that IPv6 is needed. I recently wanted to find the IPv6 address of a computer on my network. However, since I’m using autoconfiguration, I had no way of knowing what it was, unless I walked the 5 feet and checked it out on the computer itself. Instead, I went looking and found this IPv6 trick to get a list of addresses on your network. It returns the link local addresses (so it only works as long as you’re on the same link). As someone who’s trying to implement IPv6 for an ISP, I’ve found that the biggest piece lacking out there is the home router. Going forward with IPv6, it’s even less desirable to not have a hardware firewall, as it’s now not just a firewall, but an actual router. Previously, with IPv4, a home “router” actually only did NAT, not routing. With IPv6, we’re now routing all public addresses around the home, and finding one that does this somewhat intelligently is a challenge. The other piece of the puzzle you’ll need is a router that will do DHCPv6. Most ISP’s will continue to use DHCP to hand out IP addresses (v4 or v6), utilizing it’s ability to hand out prefixes (PD – Prefix Delegation) to give customers a subnet of some size (/48 and /56 seem to be the most talked about sizes) to use in their networks. The thinking is that at some point in the (hopefully) not so distant future, you’ll be able to subnet off computers, appliances, mobile devices, and whatever else we put on the interwebs into discreet subnets. So far, there are only 2 commercial routers that you can buy today that seem to work for a user looking to have IPv6 on an ISP using DHCPv6: The Apple Airport Extreme, and the D-Link DIR-615. I’ve also heard of a router made in Australia, but haven’t seen it for sale here in North America. The only other option is to try installing a third party software onto your router (ala tomato or dd-wrt) This should only be taken by those who don’t mind breaking things for fun, as the worst case scenario is wrecking the router you put it on. The good news is that there are more of these routers coming, so if you can put it off, wait a while before buying an router so you can be sure IPv6 is available. If not, maybe spend some time either ensuring it has IPv6 support now, or that you can use one of the third party software versions on the one you buy. This server has received 410099 hits from both ipv4 and ipv6.